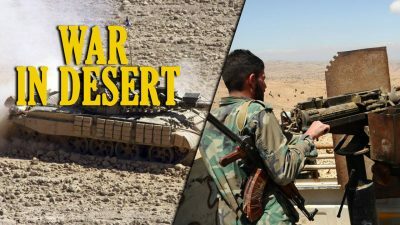 ISIS cells operating in the desert in central Syria pose a serious security threat to the government-controlled area conducting attacks on checkpoints of the Syrian Arab Army (SAA). The SAA has carried out several operations near Palmyra, Deir Ezzor and al-Mayadin in an attempt to get rid of the ISIS threat. However, so far with only limited success. Pro-government sources circulate speculations that large numbers of ISIS members, who had fled from the eastern bank of the Euphrates, which is controlled by the US-backed Syrian Democratic Forces (SDF), are preparing for major attacks on SAA positions. The towns of al-Sukhnah and Palmyra are named among the possible targets. This scenario remains unlikely because any such attack would trigger a wide-scale military operation of the Syrian-Iranian-Russian coalition in the Homs-Deir Ezzor desert. A similar situation was observed in 2018 when an ISIS terrorist attack in eastern al-Suwayda resulted in the major SAA effort that eliminated ISIS cells in the southeastern Syrian desert. At the same time, the SDF is developing its security operation against ISIS remnants in the area of al-Baghuz. This development comes amid increased activity of the ISIS cells along the entire SDF-held bank of the Euphrates. ISIS attacks have recently been reported in the areas of Al Tayanah and the Omar oil fields. Pro-ISIS sources report multiple SDF casualties. The SDF media wing remains silent. Last week, the head of the Russian reconciliation center in Syria, Maj. Gen. Viktor Kupchishin warned that French and Belgian special services are preparing a chemical provocation in the Idlib de-escalation zone. In order to organize the provocations, agents of French and Belgian special services have arrived in Idlib. They met with field commanders of the Hayat Tahrir al-Sham and Hurras al-Din terrorist groups and representatives of the White Helmets pseudo-humanitarian organization,” he said adding that the goal of the effort is to create a fake video “demonstrating Russia and Syria’s use of chemical agents against the civilian population”. The general warned that real chemical substances may be used against the civilian population in the area in order to gain more realistic footage.